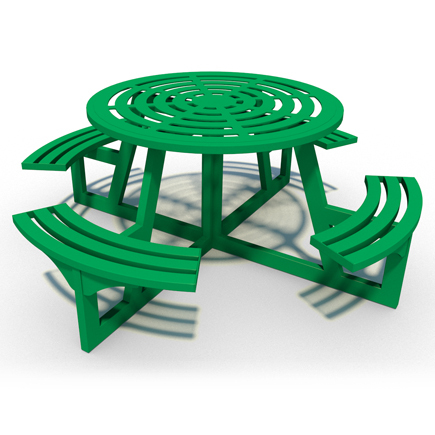 This steel circular picnic table is a must for any park or playground. Extremely strong and sturdy, this steel picnic table is available in any RAL colour and is galvanised and powder-coated to prevent rust. With the capability to sit 8 people the table is ideal for busy play areas and parks. The table has been a firm favourite with councils for many years and most of the tables are still standing. The strong structure ensures the table is able to withstand high usage and any vandalism. The table can be installed straight into grass using extending legs with anchors, or can be bolted down into an existing concrete pad. If needed, we can also price for a suitably sized concrete pad if one doesn’t exist. The table is delivered flat packed but installation is available if needed.